﻿Universidad Central de Nicaragua UCN and Universidad Católica San Antonio de Murcia (Spain) offer dual degree Master programmes via Branch Campus European Programmes in Austria and internationally. 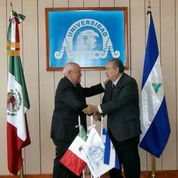 Universidad Central de Nicaragua UCN partners with Instituto Europeo Campus Stellae (Santiago de Compostela, Spain) internationally in student and faculty exchange and joint research projects. EIC is a Private Higher Education Licensed by Ministry of Higher Education Malaysia. Programs accredited by Malaysia Qualification Agency. Licensed by Ministry of Home Affairs to recruit International Student to study in Malaysia. Gold Status Approved Learning Provider by Association of Chartered Certified Accountant, UK. Universidad Central de Nicaragua UCN - European Programmes is an approved member of the QISAN Quality International Study Abroad Network. 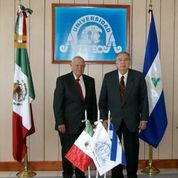 The Convention of CONIES was formally signed at the ceremony in Managua. Prof. Berchtold was awarded by UCN Rector Magnificus Ing. MSc. Dr. Giberto Cuadra Solórzano for his achievements in quality development and modernisation of distance education at the event.